to climb on a jackass? My name's Julie Püttgen. I'm an artist, expressive arts and somatic therapist, clinical mental health counselor, arts educator, and meditation teacher, none of which turn out not to be such different things. All rely on a sense of trust in the unfolding, creative process of awareness as a perfect vehicle for waking up. All also rely on improvisation - responding openly to what is, without getting too hung up on ideas of what ought to be instead. I've never actually gotten a tattoo, but I like to think about what I would get, if I did. A connect-the-dots constellation. A Mirabai quote wrapping around my wrist. 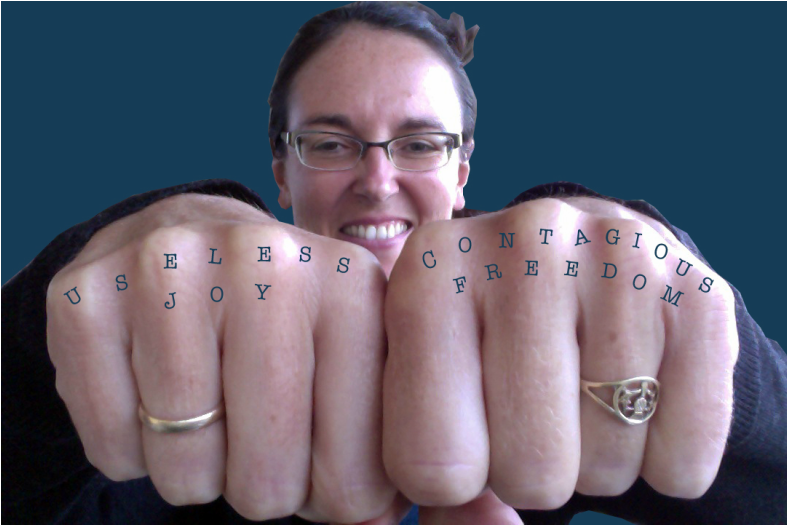 Or perhaps a set of manifesto knuckle-tats. Useless Joy is a gift from movement teacher Eiko Otake, who maintains that the highest accomplishment for human beings is to be useless & harmless. That's a long way from lofty goals of success, and it is very freeing. I trust the Taoist sense of being like water, which flows straight to the low, loathsome places, and thus finds its way. I trust the Buddhist idea of being without needing to Be Somebody Doing Something. So, that's useless. And joy, strangely, seems to be the conjoined twin of letting go. There are people and places that make us feel small, cramped, trapped, and hopeless, with no way to get anything right, or to be heard. And then, marvelously, there are people and places so utterly free & clear that they can't help but remind us of our own inherent, inalienable freedom. It's contagious & effortless: nobody is trying to change anybody else. Just: Oh! In such a presence, we realize our lives have meaning. We realize that even the really hard things that happen to us hold the potential for freedom. On this site you'll find lots of things: links to my therapy practice in Hanover, NH; meditation instructions including recordings; inner beauty products; stories and books; documentation of my public and individual art practice. My hope is for a meeting: you are here & so am I. So, what can we learn & enjoy from one another? What are the connections that bring us together? Please do contact me with your questions & responses. I look forward to hearing from you.